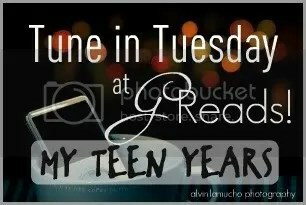 1996-1997 [Tune In Tuesday] – my books. my life. My Teen Years Special Edition: What were you listening to when you were a teenager? We all come from different decades, with different tunes. For this month, please pick some of your favorite songs that bring you back to those glorious teenage years! Since July has 5 Tuesdays, I thought I would take you on a little tour of my musical life from 8th grade through 12th grade. That was 1996-2001 for me. It was a time of boy bands, pop punk, and mainstream rap. It was an error where we didn’t just listen to one genre of music. And we didn’t always have very good taste. In fact, what you will see over the next month is slightly embarrassing. So you better enjoy it. So what was I listening to? No Doubt (w/ Weezer) was my first concert. My friend Nicole (who I am still very much friends with) and I attended with our moms. Pretty sure it was at the Silverdome. I also have fond memories of listening to this on my discman on the way to Chicago. I was 14. And a pretty innocent 14. So there is a chance I did not realize what this song was really about right away. I wasn’t quite a Freshman, but I was almost there. This was probably the biggest song that year at my school. Years later, in college, I went to a Verpe Pipe concert at a roller skating rink in Taylor, MI. But we were there for the opening band (Bliss 66) and left before they took the stage. Oh how the mighty have fallen. So what were you listening to in 8th grade? So very interesting that you and I are the same age, but different music was popular at our schools. Except No Doubt. They are popular everywhere! I was going to put Don’t Speak in mine, but decided on a different No Doubt song. Such a good song though. Oh man, I nearly forgot about Verve Pipe! Thanks! Don’t Speak was playing practically all the time when I was younger. And they played the Verve Pipe a lot when I was on holiday, I already knew The Freshman because of the Boyce Avenue cover, so I sang along with it quite happily! Awww, memories! You look young there but very much the same! I had completely forgotten about Ben Folds from back then. I like him better now. I’m right there with you on everything else. I was a sophomore in 1996, and I know that Freshman was a big song with us. One of my favorites from that year was a song called “Sucked Out” from Superdrag. They were a local band that had made it big, so they were a pretty big deal. I was into hair bands at the time, so spent a lot of time listening to Poison, Motley Crue, and other bands that wore a lot of make-up and hair spray! It was a time I remember fondly through music, and sometimes I will go back to that and immerse myself into those songs all over again. By the way, I LOVED The Freshman! Seems we went to school around the same time (I graduated in 2000). I have this No Doubt (this is my fav song of theirs) and this The Verve Pipe (Freshman came out when I was a freshman..haha) song scheduled this month! Bens Fold was a good one too! Great picks!!!!!!!! YAY for 90s music!